Marbled paper has been a huge trend in art pieces, stationery and invitations lately, so we wanted to have our hand at trying this DIY trend. Our maker Jessica tested out a bunch of techniques to narrow down exactly what materials work best to create a gorgeous and vibrant marbled design. If you have been curious about how to marble paper, follow along with our written instructions and video tutorial to craft these simple pieces with us! 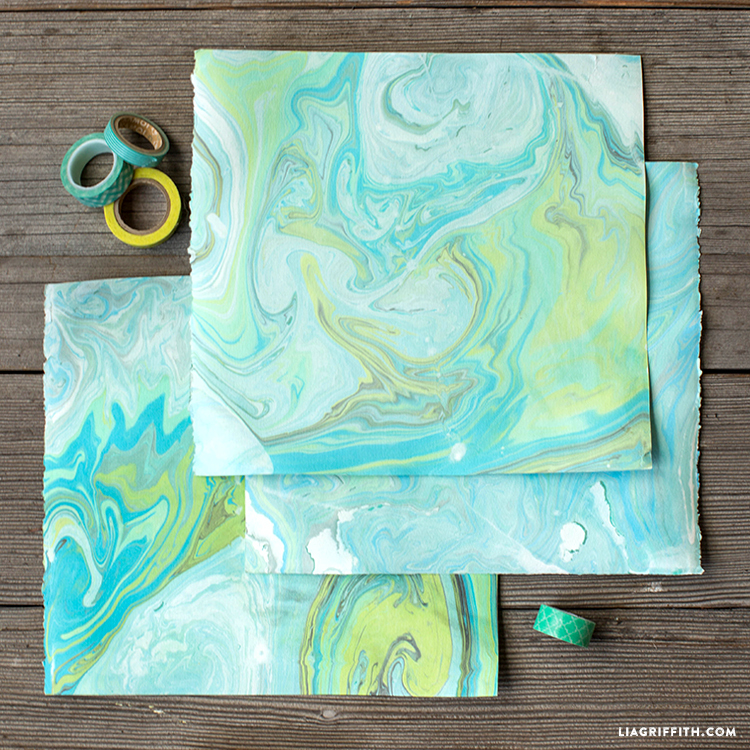 Then, once you get comfortable with the technique, stay tuned as we share tutorials for making marbleized journals, serving trays, gift wrap and more. Fill your tray with water. Add your ink colors of choice to your palette. Feel free to mix your own colors here. Place two circular pieces of “float paper” into your water, then use eye droppers to add your first drops of paint on top of the float paper. Continue adding various colors of paint to the float paper and watch the ink spread across the surface of your water. When you’re finished adding color, remove the float paper from your water. Swirl the ink around with a wood skewer and pop any air bubbles on the surface with your eye dropper. Place your copperplate paper onto the water, let it sit for about 30 seconds and remove. 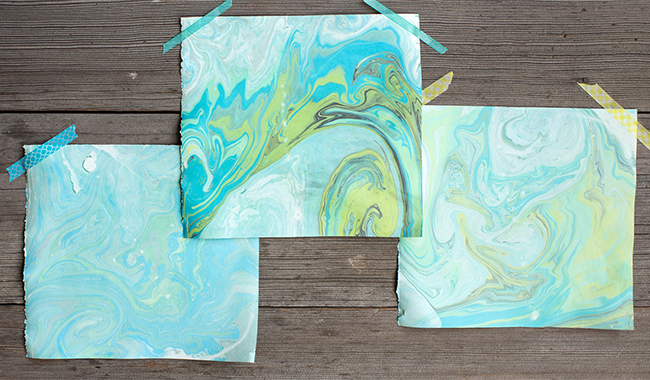 Let your marbled paper dry over paper towels. The color will become more vibrant as it dries. We did a ton of trial and error in finding the best way to make marbleized paper, and we want to share our results with you so that you don’t have to go through any of the frustrations that we had! Before landing on copperplate paper, we tried cardstock, watercolor paper, drawing paper and regular printer paper. Of those four options, printer paper worked the best. We found that the paper had to be uncoated for the ink to really adhere to it. With the other types of paper, the colors were much more muted than with copperplate paper. Suminagashi refers to the technique of using Japanese ink with “float paper.” Float paper allows the ink to remain at the surface of your water, so that the ink sticks right to the copperplate paper when you drop it in. Suminagashi ink is much thinner than craft paint, so it is perfect for sitting on the water’s surface. With craft paint, you would have to dilute it to a very specific consistency, which is frustrating to master. The ink kit that we used is from Blick. The kit only comes with primary colors, but we mixed some of the colors to create other shades. Be sure to mix the paints before dropping them into the water. Use construction paper! Works very well. This is going on my ever growing list of projects to make. Thanks Lia and gang for all your hard work so we can learn better. Beautiful! Can you please share the colors you used and what colors you pre-mixed, if in fact you did that. Thanks!! Thank you Karen! I used the blue, green and yellow (just a tiny bit) from the kit we link to in the post. I did a little pre-mixing of blue and green, and then a little blue/green/yellow. Do you think this could be done in larger scale instead of using paper use canvas? I don’t think so, you’ll want to use a paper that will absorb the ink nicely and I don’t think canvas will work. I can’t find copperplate paper, where did you get yours?? Blick! We’re lucky their retail shop is just around the corner from the office, but they do sell it online. Have you tried this technique to marble fabric? No, but we want to try! Is float paper cut from copperplate paper or regular print paper? We used both! The regular paper was great to practice on. Thank you Lia. It is beautiful. I’m going to try this.. This is gorgeous! I’m going to have to try this soon : ) Thank you for the great projects and tutorials. You make this look sooooo easy. I’ve always been hesitant to try this process, but I’m in now! I looked at the kit on Blick and it says ages 6 to adult–ha ha — that means even I can do it! Yes! It took a few tries to get it right but we loved learning the process.